If you blog, this has probably happened to you: you are anticipating an event and shaping it into a blog post before it even happens and then it goes differently than you thought it would, in a big or even in a small way, and then you’re not sure how to present it. Anyway, we had out-of-town relatives visit this weekend and went to see the cherry blossoms and June has her first loose tooth. Both events were long anticipated. The original prediction for peak bloom was the last week of March and we thought we might miss it while we were out of town, but then we had a long cold spell and it was pushed back not once but twice, all the way to last weekend, which coincided with a visit from my mother, aunt, cousin and cousin’s son. It seemed like the stars were aligning for my mom, who has never seen the cherry blossoms in full bloom despite several tries. 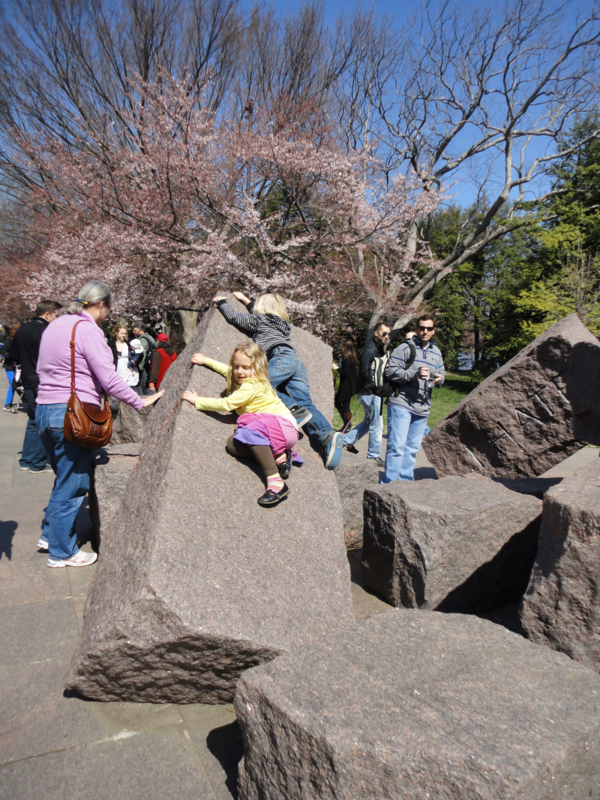 We did come awfully close last year, though (“Cherry Blossom Baby,” 3/25/12). Meanwhile, June has been watching her friends lose their teeth for years (the first kid she knew to lose one was a preschool classmate) with jealousy and impatience and the occasional spurious claim that she had a loose tooth of her own. But then on Wednesday evening she was eating a banana and when she bit into it she said her tooth hurt. A little later she said it was loose and I asked her to wiggle it and sure enough it wasn’t just loose but nearly ready to come out, from what I could tell. She showed it to her friends at school the next day and Megan, who has experience with loose teeth, predicted it would be out by Sunday at the latest. I had a dentist appointment in the city in the morning to reattach a crown that popped off while I was eating saltwater taffy earlier in the week so after that Mom and I met at the Phillips Collection and spent several hours there. I’d almost forgotten it was possible to spend so much time in a museum, rather than rushing in and out so the kids won’t get antsy. I’d picked it mainly out of convenience because it’s close to my dentist. But that didn’t matter, almost any museum would have done. At this one there was an exhibit on three abstract expressionists, one of Italian photographs, and another one consisting of rubber sculptures that were “meditations on the brevity of life.” (This sounds weird, but I recommend it. You really have to see it to get it.) We listened to a gallery talk on Renoir’s “Luncheon of the Boating Party” and went into a new, permanent installation, a closet-sized room whose walls have been coated with beeswax. It smells wonderful and it’s quite soothing to step into it. We also saw part of a Jacob Lawrence series of Northern migration of African Americans, and a good bit of the permanent collection, including Van Gogh, Cézanne, O’Keefe, and many other familiar artists. In between we had lunch at the museum café and browsed in the gift shop. At brunch we learned Josiah also has his first loose tooth and I told Emily we might have just the thing for it—some saltwater taffy we’d bought for them at the beach. After all, it took a tooth out of my mouth, albeit a fake one. I’d forgotten to bring it to the restaurant, (the taffy, not my crown) but I promised to bring it to our next rendezvous. Surely one of these kids is going to lose a tooth this weekend, I thought. After brunch and some playground time (during which Noah seemed to have as much fun pretending the big climbing/slide structure was a ship going to France and then Indiana as the younger kids did) we split up so the out-of-town folks could go to Air and Space while we stayed home for homework, grocery shopping, and a birthday party. We met up again in the city for dinner at an Ethiopian restaurant, very close to where we used to live in DC. This mural really took me back when we exited the station. Seeing all those painted people was like re-encountering long-lost friends. Mom and Beth had a difficult time convincing me to agree to this outing because I am a stick in the mud and I didn’t think the kids would eat anything and I knew even an early dinner would keep us out later than I’d like. I was wrong on the first count. Noah actually liked the food and said he wants to go back some day. June mostly ate tomatoes we picked out of one dish and the spongy bread, but it was okay because she was still full from birthday cake at her friend’s party. After dinner, Josiah tore into the taffy, but his tooth did not exit his mouth. 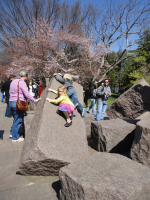 Sunday was the main event: cherry blossoms. I mentioned this on Facebook Saturday evening and a friend of mine said she’d been there that day and the blossoms were not in bloom yet, although she said they looked “ready to burst.” Sometimes a day can make a big difference, so I hoped for the best. 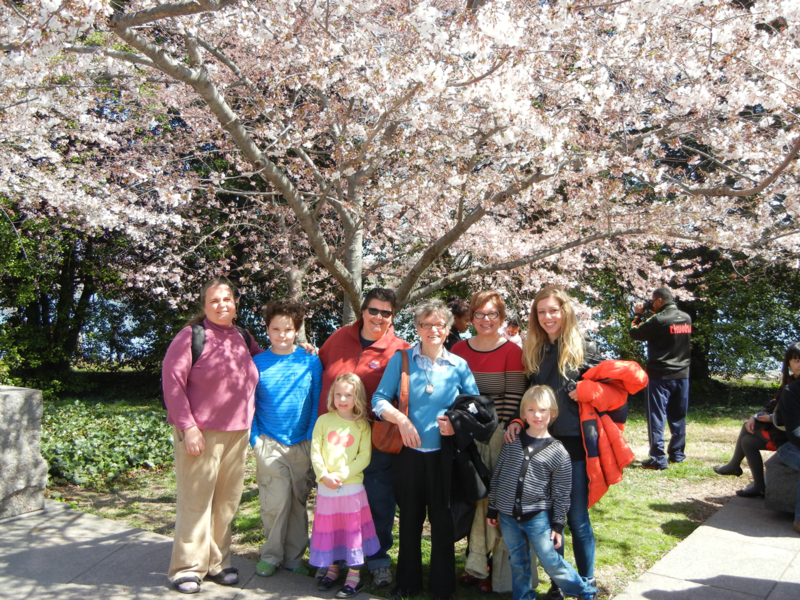 We all met at the Smithsonian metro stop and walked toward the Tidal Basin. I warned my mom ahead of time about what my friend said, and it was probably a good thing I did because they just weren’t there yet. A few trees here and there were in bloom (we found one for the group photo), but mostly they were just as Kathryn had said, “ready to burst,” but not bursting. Still, it was a lovely spring day, a bit chilly in the morning, but sunny and warmer as the day progressed. We walked all around the Tidal Basin, stopping to admire the MLK Memorial and to look at the statues and waterfalls and climb the rocks at the FDR Memorial. We picnicked on fried rice and eggrolls from the Asian food stand and everyone seemed to have a good time, even without the blossoms. 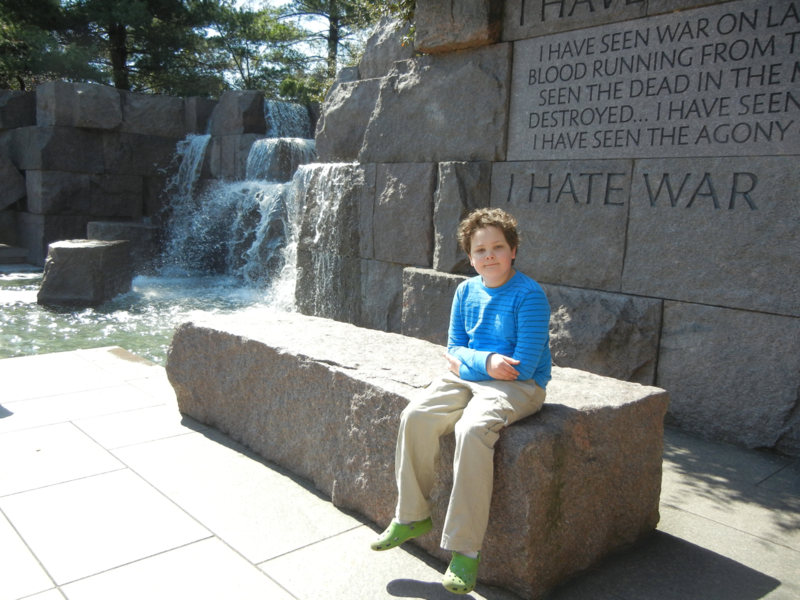 Anyway, the moral of this blog post was going to be about the exuberance of spring and kids growing up and waiting for things and being rewarded, but the blossoms didn’t cooperate and neither June nor Josiah lost a tooth, so I guess it must be about something else. Of course the blossoms will bloom, whether we make it down there at the right time this year or not, and those wiggly teeth are going to come out sooner or later. So maybe it’s about patience and enjoying what you have while you wait for other things, and doing that with equanimity rather than just managing keep a grip. That’s often a good strategy for life anyway. 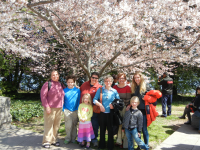 This entry was posted in Cherry Blossoms, Excursions, Extended Family by Steph. Bookmark the permalink.